PHILADELPHIA (Embargoed until 6:30 p.m. EDT, Tuesday, June 26, 2018) – In the battle against metastatic castrate-resistant prostate cancer, studies have demonstrated a high response rate to radionuclide therapy targeting prostate specific membrane antigen (PSMA) with the radionuclide lutetium-177 (177Lu). At the 2018 Annual Meeting of the Society of Nuclear Medicine and Molecular Imaging (SNMMI), researchers reported on a phase II prospective trial. Using gallium-68 (68Ga)-PSMA11 positron emission tomography (PET) imaging, men who had exhausted conventional therapies were screened. 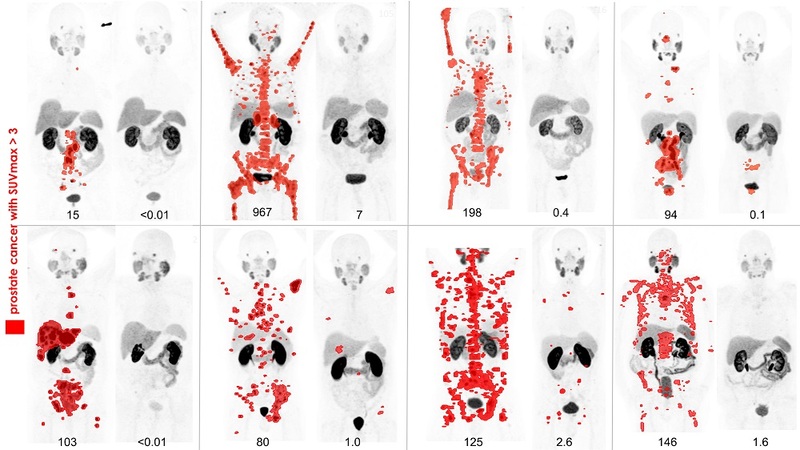 Those with high PSMA-expression proceeded to 177Lu-PSMA617 (LuPSMA) therapy and experienced high response rates, which is clearly demonstrated in the PSMA PET imaging figure selected as the 2018 SNMMI Image of the Year. Each year, SNMMI chooses an image that exemplifies the most promising advances in the field of nuclear medicine and molecular imaging. The state-of-the-art technologies captured in these images demonstrate the capacity to improve patient care by detecting disease, aiding diagnosis, improving clinical confidence and providing a means of selecting appropriate treatments. This year, the SNMMI Henry N. Wagner, Jr., Image of the Year was chosen from more than 2,200 abstracts submitted to the meeting and voted on by reviewers and the society leadership. The 2018 Image of the Year goes to a team of researchers at the Peter MacCallum Cancer Centre in Melbourne, Australia. The image demonstrates exceptional responses in a series of patients who received LuPSMA therapy after other treatments stopped working. In each patient, the extent of tumor spread before and after treatment is visualized with clarity using PSMA PET. These patients experienced improved quality of life, including reduction of pain, and correlated with marked reduction of prostate specific antigen (PSA), a blood tumor marker. IMAGE OF THE YEAR: PSMA PET before and after lutetium-177 PSMA617 theranostic in 8 patients with metastatic prostate cancer who exhausted standard therapeutic options. 68Ga-PSMA11 PET maximum intensity projection (MIP) images at baseline and 3 months after 177Lu-PSMA617 in 8 patients with PSA decline ≥ 98 percent in a prospective phase II study. Any disease with SUV over 3 is in red. Credit: Michael Hofman, John Violet, Shahneen Sandhu, Justin Ferdinandus, Amir Iravani, Grace Kong, Aravind Ravi Kumar, Tim Akhurst, Sue Ping Thang, Price Jackson, Mark Scalzo, Scott Williams and Rodney Hicks, Peter MacCallum Cancer Centre, Melbourne, Australia. "This work reflects an appreciation for all the basic science and translation work that has been performed by many groups over a long period of time to develop prostate-specific membrane antigen (PSMA) theranostics as a paradigm-changing practice for improving patient outcomes,” explained Professor Michael Hofman of the Peter MacCallum Cancer in Melbourne, Australia. “These images tell a story about exceptional responses observed in patients who had progressed after standard therapies. They match striking improvements in patient quality of life. With further research, we look forward to seeing nuclear medicine evolve as a key specialty and standard-of-care in cancer management." He added, "I would also like to extend thanks to ANSTO, Australia's producer of no-carrier-added Lutetium-177, and Endocyte, which produces PSMA; they helped make this study possible." Abstract 531: “High activity, pain reduction and low toxicity with Lutetium-177 PSMA617 theranostics in metastatic castrate-resistant prostate cancer (mCRPC): results of a phase II prospective trial,” Michael Hofman, John Violet, Shahneen Sandhu, Justin Ferdinandus, Amir Iravani, Grace Kong, Aravind Ravi Kumar, Tim Akhurst, Sue Ping Thang, Price Jackson, Mark Scalzo, Scott Williams and Rodney Hicks, Peter MacCallum Cancer Centre, Melbourne, Australia.